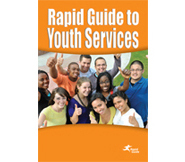 Help young adults get life started on the right track and make good decisions with Rapid Guide to Youth Services! Learn More. 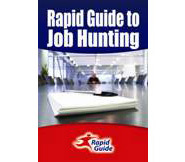 Use Rapid Guide to Job Hunting as a handout or workbook for guidance sessions! Learn More. Job seekers in your community get hired quicker with the most current tips and resources from Rapid Guide to Job Hunting! Learn More. 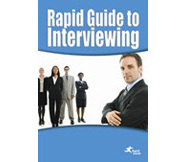 Teach your business community how to make better hiring decisions with Rapid Guide to Interviewing. Learn More. Rapid Guides are a simple, low cost way to improve your recruiting efforts! Here's how. Rapid Guide to Job Hunting prepares your for successful interviewing! Learn More. 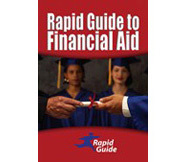 Help students and parents navigate the financial aid process with Rapid Guide to Financial Aid! Learn More. Boost awareness of your programs while educating students on life after high school! Learn More. Give local youth the info they need to succeed in life as a young adult! Learn More. 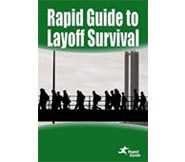 Rapid Guide to Layoff Survival is the perfect workshop handout for dislocated workers looking for employment! Learn More. Raise awareness of your Workforce Business Services Programs by providing Rapid Guide to Interviewing to your business community. Learn More. Hundreds of organizations across the country are providing Rapid Guides to educate their customers. These organizations provide outstanding feedback on what a cost-effective tool Rapid Guide is in increasing awareness of their programs and use of their services. Learn how we can do the same for your organization by clicking on the Rapid Guide cover below that represents your area of interest. The Rapid Guide to Job Hunting outlines these basic interviewing rules in an easy-to-follow format. You might laugh at some of the obvious Tips. If you spent a few days as a recruiter listening to the sales executives tell you why they have eliminated 9 of the last 10 people they interviewed, you would understand the importance of these reminders for prospective candidates. Anyone preparing for a job search will benefit from the advise shared in this book.